The boolean isRemovable defines if the hashtag can be removed from the list, by displaying a button next to it. The boolean withHashSymbol allows to automatically display a '#' symbol before the word. NOTE: By default, the hashtag will display the hash symbol and won't be removable. You can use the Hashtags view either directly from the code, or through your Interface Builder. Simply define a UIView and set its class to HashtagsView. You're all set. You can add one, or multiples hashtags at the time. Same if you want to remove them. You may want to expand the size of your HashtagView when the hashtags exceed the actual size of the view. One good way to expand the height of your HashtagsView when needed is to set a height constraint on it (from the code or interface builder). Then you can modify the constant property of the constraint when the view needs to be expanded. Add an animation and you got it !
. Check our example project for more details. You can change style attributes of the view and the design of the hashtags themselves. 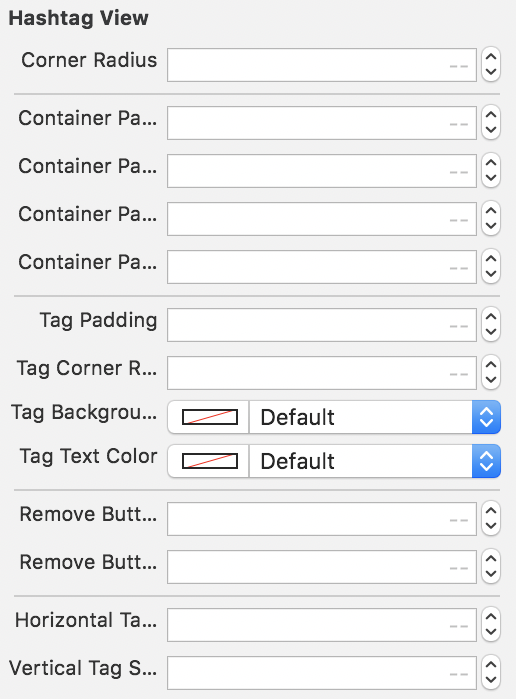 If you decided to define the view from Interface Builder, you have access to those values too.